Always make sure that the surface elements on your stove are not hot and have cooled down before handling them. If one or more of the surface elements have stopped working on your oven or stove/cooktop you can do a visual check by simply looking to see if there is a break in the element or if the element has bubbling, a burned hole or blistering. If the surface element does have visible damage, more than likely it is bad. However, you can’t always tell if an element is good or bad by just examining it with your eyes. Check to make sure that the surface element has not become loose from the terminal block that it is plugged into. Some surface elements simply plug into the receptacle – terminal block requiring no tools for removal or replacement. Other elements have a screw attaching them to the receptacle – terminal block. Make sure that the screws are tight and have not come loose, a regular or Phillips head screw driver will be required. If the coil surface element still does not heat up after the above procedures have been performed you will need to do a continuity test. If you have a multi meter or OHM meter you can check the element for continuity, if the element shows continuity then it is good. If it shows no continuity then the element is bad and will need to be replaced. If the damage is on the terminal ends of the element with corrosion buildup or signs of charred or burnt spots it is a good idea to replace the terminals as well or else you might not have good electrical contact after the new element has been installed. If you have checked the element for continuity and it is good, next you need to check the receptacle terminals and wires for obvious damage such as burnt spots, melted plastic, arching or corrosion, if damage is found you need to replace the terminal block with a new one. If you have checked the coil element and the terminal block receptacle and have determined that they are both good and in working order, you will need to check the infinite switch – surface burner switch for continuity. It is the switch that the coil element selector knob is attached to on the console or top of your oven/stove, depending on the make and model. If the switch is bad replace it with a new one. 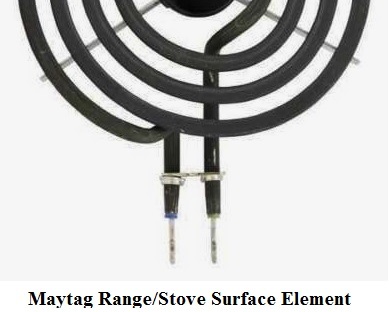 Above I have listed the most common reasons why range/stove surface elements will not heat or function properly. If you are not able to repair your stove/range with the repair help that I have listed above you should call a reputable and qualified service technician who can, hopefully get your oven back in working order.